Imagine slipping into a jacket, shirt or skirt that powers your cell phone, fitness tracker and other personal electronic devices as you walk, wave and even when you are sitting down. 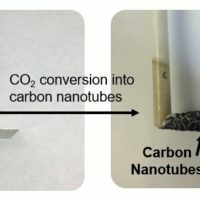 A new, ultrathin energy harvesting system developed at Vanderbilt University’s Nanomaterials and Energy Devices Laboratory has the potential to do just that. Based on battery technology and made from layers of black phosphorus that are only a few atoms thick, the new device generates small amounts of electricity when it is bent or pressed even at the extremely low frequencies characteristic of human motion. 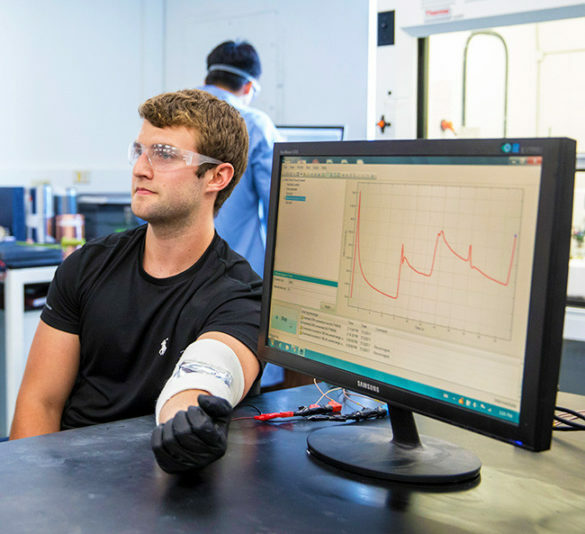 “In the future, I expect that we will all become charging depots for our personal devices by pulling energy directly from our motions and the environment,” said Assistant Professor of Mechanical Engineering Cary Pint, who directed the research. The new energy harvesting system is described in a paper titled “Ultralow Frequency Electrochemical Mechanical Strain Energy Harvester using 2D Black Phosphorus Nanosheets” published Jul. 21 online by the journal ACS Energy Letters. “This is timely and exciting research given the growth of wearable devices such as exoskeletons and smart clothing, which could potentially benefit from Dr. Pint’s advances in materials and energy harvesting,” observed Karl Zelik, assistant professor of mechanical and biomedical engineering at Vanderbilt, an expert on the biomechanics of locomotion who did not participate in the device’s development. Currently, there is a tremendous amount of research aimed at discovering effective ways to tap ambient energy sources. 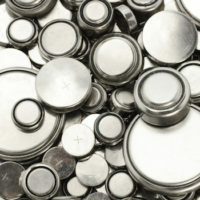 These include mechanical devices designed to extract energy from vibrations and deformations; thermal devices aimed at pulling energy from temperature variations; radiant energy devices that capture energy from light, radio waves and other forms of radiation; and, electrochemical devices that tap biochemical reactions. 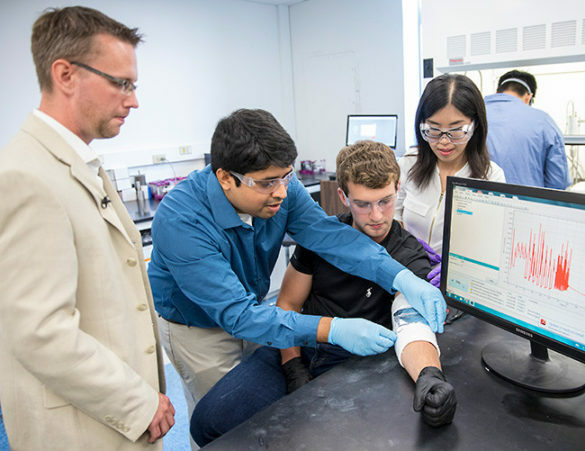 Doctoral students Nitin Muralidharan and Mengya Li co-led the effort to make and test the devices. “When you look at Usain Bolt, you see the fastest man on Earth. When I look at him, I see a machine working at 5 Hertz,” said Muralidharan. Extracting usable energy from such low frequency motion has proven to be extremely challenging. 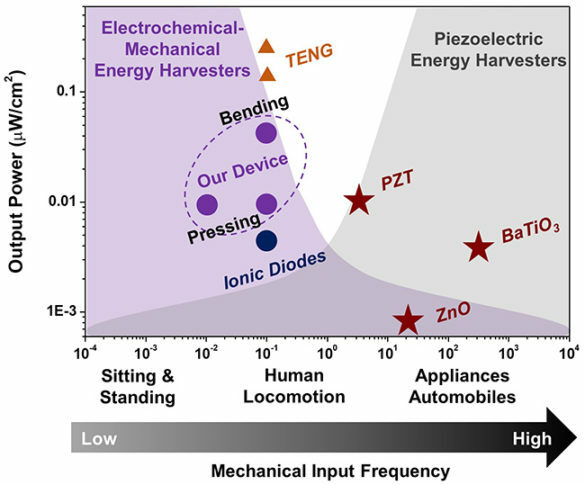 For example, a number of research groups are developing energy harvesters based on piezoelectric materials that convert mechanical strain into electricity. However, these materials often work best at frequencies of more than 100 Hertz. This means that they don’t work for more than a tiny fraction of any human movement so they achieve limited efficiencies of less than 5-10 percent even under optimal conditions. “Our harvester is calculated to operate at over 25 percent efficiency in an ideal device configuration, and most importantly harvest energy through the whole duration of even slow human motions, such as sitting or standing,” Pint said. 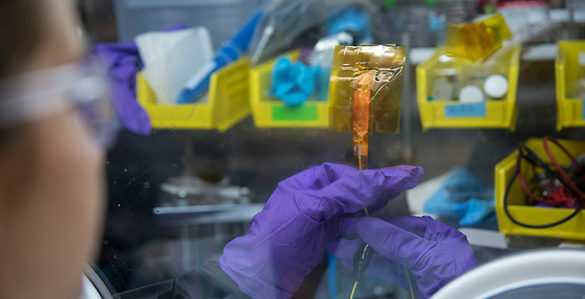 The Vanderbilt lab’s ultrathin energy harvester is based on the group’s research on advanced battery systems. Over the past 3 years, the team has explored the fundamental response of battery materials to bending and stretching. They were the first to demonstrate experimentally that the operating voltage changes when battery materials are placed under stress. Under tension, the voltage rises and under compression, it drops. These observations led Pint’s team to reconstruct the battery with both positive and negative electrodes made from the same material. Although this prevents the device from storing energy, it allows it to fully exploit the voltage changes caused by bending and twisting and so produce significant amounts of electrical current in response to human motions. The lab’s initial studies were published in 2016. They were further inspired by a parallel breakthrough by a group at Massachusetts Institute of Technology who produced a postage-stamp-sized device out of silicon and lithium that harvested energy via the effect Pint and his team were investigating. 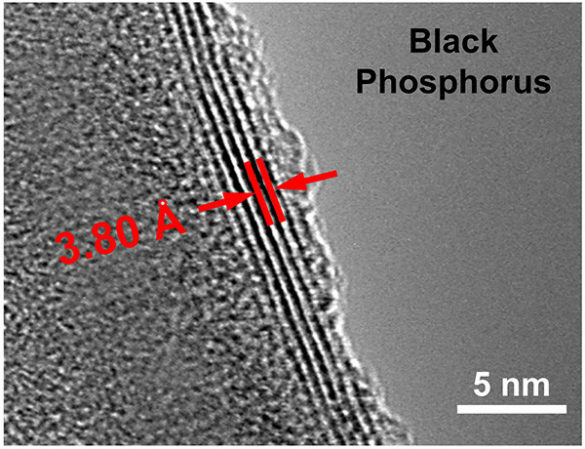 In response, the Vanderbilt researchers decided to go as thin as possible by using black phosphorus nanosheets: A material has become the latest darling of the 2D materials research community because of its attractive electrical, optical and electrochemical properties. Because the basic building blocks of the harvester are about 1/5000th the thickness of a human hair, the engineers can make their devices as thin or as thick as needed for specific applications. They have found that bending their prototype devices produces as much as 40 microwatts per square foot and can sustain current generation over the full duration of movements as slow as 0.01 Hertz, one cycle every 100 seconds. 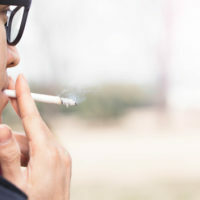 The researchers acknowledge that one of the challenges they face is the relatively low voltage that their device produces. It’s in the millivolt range. However, they are applying their fundamental insights of the process to step up the voltage. They are also exploring the design of electrical components, like LCD displays, that operate at lower than normal voltages. One of the more futuristic applications of this technology might be electrified clothing. It could power clothes impregnated with liquid crystal displays that allow wearers to change colors and patterns with a swipe on their smartphone. “We are already measuring performance within the ballpark for the power requirement for a medium-sized low-power LCD display when scaling the performance to thickness and areas of the clothes we wear.” Pint said. Vanderbilt doctoral students Rachel Carter, currently a postdoctoral researcher at the Naval Research Laboratory, and Nicholas Galioto, an undergraduate mechanical engineering student also contributed to the research, which was supported by National Science Foundation grant CMMI 1400424 and Vanderbilt University’s discovery grant program.